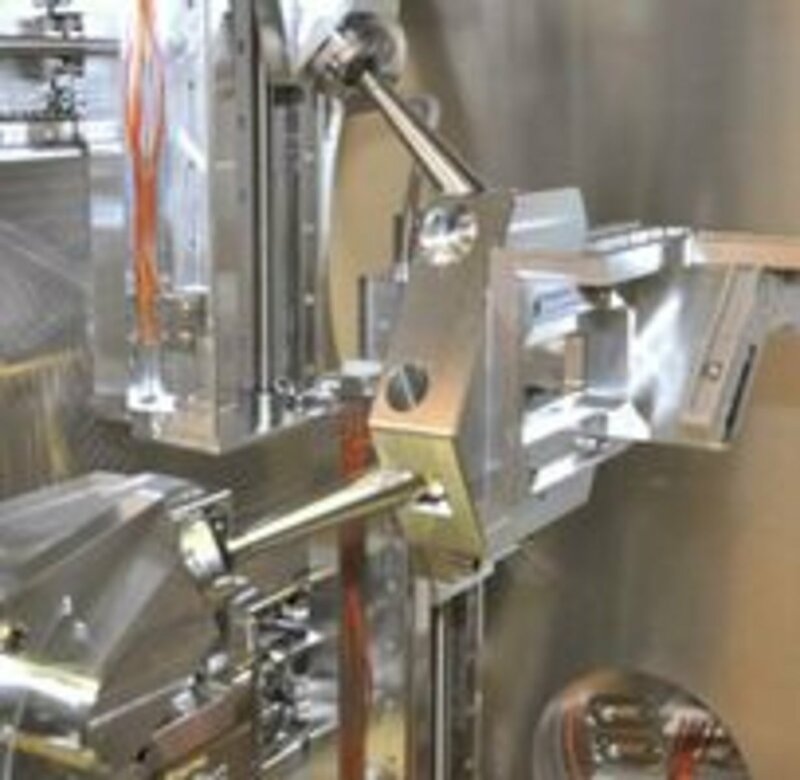 At the PETRA IIIlight source, located at DESY research centersite in Hamburg, Germany, the P05 Imaging Beamline is operated by the Helmholtz-Zentrum Geesthacht (HZG). Apart from the monochromators and standard optical and diagnosticcomponents like apertures or beamposition monitors a large vacuumtank for X‐ray lenses and a relatedaperture is included in the x-ray opticshutch. These optics are required for creating a virtual source necessary to operate the nanotomography experimental hutch. The tank can also hold a diffuser, should this be necessary to reduce beam in homogeneity or to decrease the degree of coherence. The vacuum chamber was designed at PI from the scratch. The limited space inside the hutch set strong constraints on the outer dimensions, while inside the tank, there was the demand for very many moving axes. 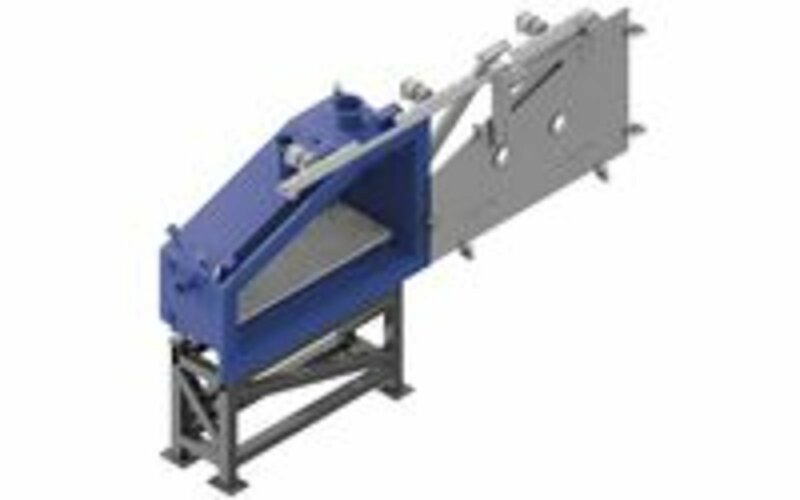 The chamber design includes a sliding door for easy maintenance and provides 0.5 m3 of space. It is made from stainless steel and holds a vacuum of 10-8 hPa. Other features are external reference points for absolute alignment, a manually adjustable chamber stand, and a manually adjustable decoupled base inside the vacuum. 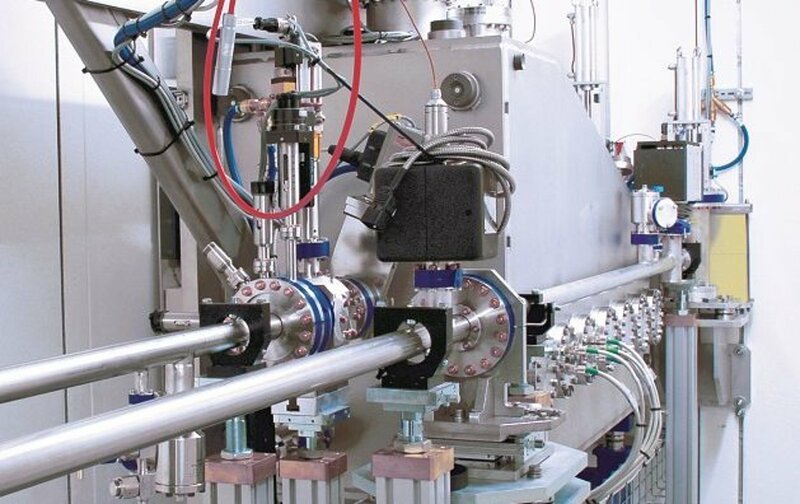 The instrumentation inside the vacuum tank included requirements for four degrees-of-freedom lens alignment and long-stroke positioning of an aperture in the focus. Essential for the application is a long-term position stability combined with a very high positioning resolution. All motion axes had to be decoupled from the chamber. 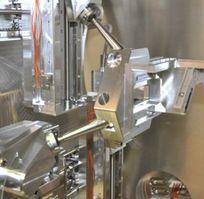 For motion control, a common electronics and software platform was chosen, so all axes are controlled over the same user interface which can be integrated in the hutch’s TANGO software environment. For lens alignment, a parallel-kinematic 6-DOF SpaceFAB robotics was chosen, that allows flexible setting of the pivot point by software. The very stiff design is low-profile and provides the required travel ranges of 50 mm (X), 3 mm (Y) and 20 mm (Z) with a linear resolution of 1 μm. Tilting adjustment in all angles can bedone over ±2.5 degrees with a resolution of 0.0003°. The aperture can be positioned over 500 mm stroke with 10 μm resolution using a customized UHV stage. 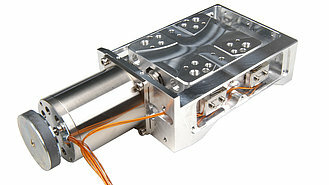 All axes use UHV-compatible stepper motors.